Anyone who follows football up close - be it supporters, journalists or pundits - experiences a feeling of déjà vu every once while throughout a season: The feeling of almost being able to guess a final scoreline, the unshakable feeling that that passage of play, that goal, that dummy was already witnessed the year before. Whether it's the top clubs finally gelling and trouncing opponents in cold week nights or a weekend of flooded pitches, there is sometimes the impression that everything has indeed already been invented when it comes to football. 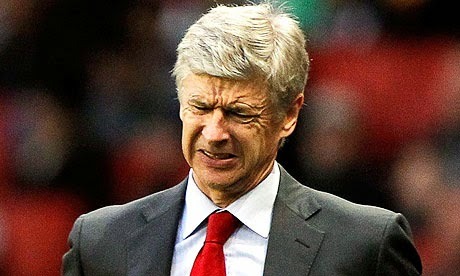 But perhaps nothing leaves us with the feeling of being smack in the middle of "Groundhog Day" like good old Arsenal. Following the Gunners' fortunes is nothing short of watching sequels of bad franchises, where despite the odd change of personnel here and there, we all seem to have a very well informed guess about how things will turn out eventually. The previous season has just ended. After a tottery mid-season, Arsenal managed to finish in the ever precious fourth spot and clinch their place in the crucial Champions League. Wenger, true to form, assures supporters and journos alike that lessons have been learned and that the off-season will be spent plugging the glaring holes in his squad - namely virtually any position from central midfield backward. However, by August there have usually been few pieces of business apart from the already traditional signings of potential game-changing youths that will be supposed to evolve into powerhouses within a few years under Wenger's tutelage. By then supporters start to get restless and Wenger duly abides; over the past few years he has ended up splashing some cash on an attacking player (in previous years not even that) promising to revolutionise the team's game. Any of the previous season's troubling positions end up being ignored. By September and early October, Arsenal seem to get firing on all cylinders. The latest acquisition - Olivier Giroud, Lukas Podolski, Mezut Özil, Santi Cazorla, Alexis Sánchez, what have you - seems to be keeping the manager's promise and rumours start flying about the possibility of this being Arsenal's year at long last, the time where all the planning from previous seasons come to fruition. This is the time when Arsenal top the league (or hover nearby) and where changes in backroom personnel are put under the microscope to explain the latest change in the team's fortunes. By late October, early November, some worrying signs start to surface. An important player gets injured, then another, then another. Late September's initial drubbings in the Champions League gradually give way to pale performances that usually end up costing the Gunners the group's top spot in the end. The inevitable elimination from one of the cups tends to follow, as well as the first points dropped in places where title candidates cannot afford. With the Premier League's busy schedule over Christmas and New Year, this tends to be the moment where Arsenal wave a definite goodbye at any illusion they may have harboured of fighting for the contest. The home draw against a midtable team, the barely comprehensible defeat away to bottom-dwellers - all of it paints the picture of a distraught team with holes throughout that are too big to ignore. By late February, Wenger sings the tune of being involved in several fronts, only to see the league's big dogs get farther and farther away. In the Champions League, the "bad luck" draws one of Europe's powerhouses and Arsenal crash out of the competition either in the last sixteen or in the quarter-finals at the very latest. The conclusion is always identical: positive brand of football but ultimately an approach that is absolutely unsuitable to Europe's top echelon. The quicker players slowly start coming back from injury. With a less congested schedule, the team seem to get back to its best. A spirited comeback is needed to ensure the crucial fourth spot, even though it seems too far off this time around. By March and April, some are left wondering where this Arsenal were all this time - the courage, the resilience, the excellent football, the joint effort of all the artists and hard workers on the same page. What once looked like a mirage - qualifying for the Champions League - now seems possible. Just. By May, the Gunners end up achieving their (what one can only assume should be a) secondary goal. Whatever chances of putting their hands around some silverware dissipated in some unlucky clash with a Championship team or a side that ended up being relegated from the Premier League. Wenger, true to form, assures supporters and journos alike that lessons have been learned and that the off-season will be spent plugging the glaring holes in his squad. Spot on Vasco. I've been supporting Arsene all this time but I would give him next year to mount a serious title challenge or walk away and let someone else have a go.